I am sitting here breakfasting on figs, prosciutto and Gorgonzola cheese. That is what the new me eats! "'A perfectly ripe fig, and there are few things better, will be slightly withered at the stem and have splits in the skin. As the Italian saying goes, a ripe fig shold have 'Il collo d'impiccato e la camicia da furfante' -- or roughly translated, a neck like a man who has been hanged and an open shirt like that worn by a thief." Such a saying, to describe a gentle ripe fig! How in the world would I even know what the neck of a hanged man looks like? Who knew thieves wore open shirts? Who do they think I am, Floria Tosca? Those Italians, they are so violent! I know I am always writing this, but I really wish Leonard Pennario were around so I could bounce this off him and hear him laugh. I was always teasing him about how Italian he was. And something like this saying, he would teach me how to say it really Italian, with the emphasis on all the right things. 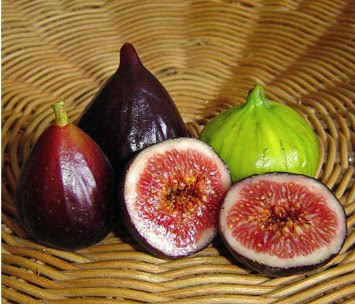 He would be laughing and laughing over these figs. And at me living the fig lifestyle. Well, I cannot for long. I have tons, tons, oodles of work to do today. You know what, my friend Gary has been telling me about this trip he is taking soon to Italy to stay with an old friend of his who lives in, I don't know, Tuscany with her husband. They own a vineyard and they have this gigantic villa and he is going to stay with them. And I imagined this woman over there in, I don't know, Tuscany. With her villa and her vineyard. I thought: What did she do right that I did wrong? Every morning I will bet she breakfasts on figs and Gorgonzola cheese and prosciutto. And then she yawns and stretches. And she walks out into the vineyard and the sun shines on her face and she ambles around, checking out how the grapes are doing. Well, at least this morning, for a fleeting five minutes, I get a taste of that life! I'm living the instant oatmeal lifestyle. ...and what happened to the horse hair? Figs without horse hair? I'm sticking to oatmeal too (though neither the instant kind nor the steel cut kind—no patience to cook it that long). But since I put fruit in my oatmeal, I could add figs BUT NO horse hair; I don't think horse hair qualifies as a "fruit," I suppose you could check with Howard's barber?